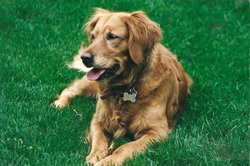 Sophie was an AKC Golden Retriever from the Field and Trial Line. She was a beautiful dark auburn color with chocolate-colored eyes. She had a laid-back personality, but was very active with the four children in her household. She was everything from a mascot at soccer games to a master swimmer. She enjoyed cuddling, sticks, taking walks, going "buh-byes", cuddling, cuddling, and more cuddling. She was the first golden at Country Acres and produced 33 puppies. She passed away in December 2008 at age 12. 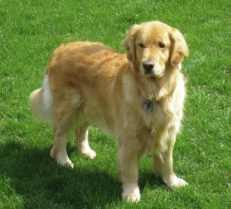 Emma was an AKC Golden Retriever from the Field and Trial Line. She was Sophie's daughter from her first litter. She was a medium golden color with chestnut-colored eyes. She was enthusiastic, fun-loving, and had lots of energy for agility, going for runs, swimming, and playing with the four children in her household. Emma enjoyed biscuits, sticks, being chased, belly rubs, and snuggling. She was the second golden at Country Acres and produced over 23 puppies. Emma passed away in October 2009 at age 11. Chloe was a 10 year old AKC Golden Retriever from championship lineage. She was the matriarch of our current lineage. Her hobbies included playing with her tennis balls (she probably had over 30), swimming, going "buh-byes", taking walks, rocks, belly-rubs, cuddling, and eating. She had a sweet disposition, was very mellow, rarely barked, and tolerated her cat "sisters". 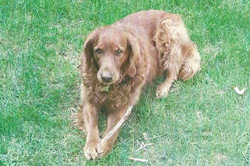 Chloe was medium golden with light feathering, with chestnut-colored eyes. She weighed 80lbs, had a blocky head, and a broad chest. Chloe was a lovable, charming, devoted companion and we miss her dearly. She passed away in May 2015.